Howard Thurman (1900–1981), dean of Marsh Chapel from 1953 to 1965, considered one of the 12 greatest preachers in the United States according to the April 1953 issue of Life magazine, was best known for his passionate pulpit style. Thurman not only was the first African-American dean of the chapel at a major white institution of higher learning, but also was among the first to conduct Christian chapel services in a nontraditional way, drawing from such eastern religious faiths as Buddhism and Hinduism. 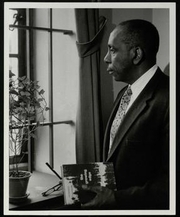 Thurman's life and thought are reflected at Boston University in the Howard Thurman Center, which is part of the Martin Luther King, Jr., Center, and in the Howard Thurman Listening Room, located in the basement of Marsh Chapel. Howard Thurman is currently considered a "single author." If one or more works are by a distinct, homonymous authors, go ahead and split the author. Howard Thurman is composed of 4 names. You can examine and separate out names.